LAHORE: The Pakistan Muslim League-Nawaz (PML-N), after a period of brief relief, is in hot water again after its president and former Punjab chief minister, Shehbaz Sharif was arrested by the National Accountability Bureau (NAB) on Friday for his alleged involvement in the Rs 14 billion Ashiana Housing scam. Shehbaz, who is also the leader of the opposition in the National Assembly, has been accused of corruption in the Ashiana Housing scheme case. He will be produced before Accountability Judge Syed Najmul Hassan for a 14-day physical remand on Saturday. He will be kept in a highly-secured lock-up inside the NAB Lahore office until his appearance in court. Shehbaz was detained by NAB officials after he appeared before the bureau in the Saaf Pani Company scam case at around 2:55pm on Friday. The news of his arrest emerged around 3:35pm after his car was sent away. His private staff who accompanied him as security were also sent away. 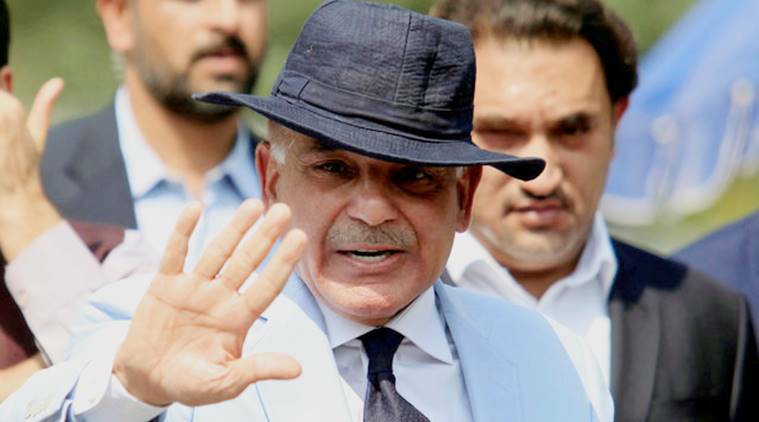 NAB sources said that Shehbaz was arrested after former top bureaucrat Fawad Hasan Fawad told the anti-graft watchdog that he carried out corrupt activities in projects in Punjab at Shehbaz’s behest. In the investigation that followed, Fawad and Shehbaz appeared together, during which the latter said he would bring proof. Subsequently, NAB granted time to Shehbaz to gather proof, but he could not produce anything. Therefore, the anti-graft body summoned him on Friday in the Saaf Pani Company case, which is one of the 56 companies being investigated for mass corruption. 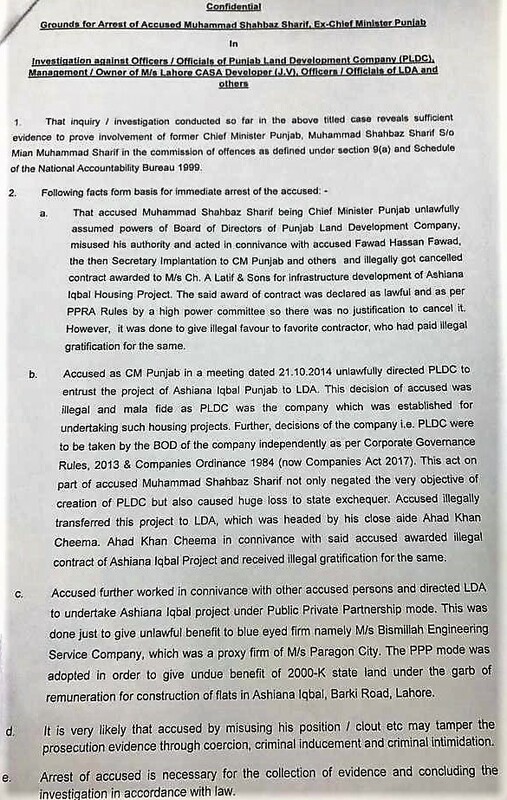 NAB has alleged that as chief minister of Punjab, Shehbaz Sharif transferred the Ashiana Scheme project from Punjab Land Development Company (PLDC) to Lahore Development Authority (LDA), ordered for the project to be transferred back from LDA to PLDC, illegally ordered for the project to be transferred to Paragon Housing Society and then kept it in Public-Private Partnership (PPP) mode, interfered in board affairs and took measures in violation of the law, and illegally canceled the contract of Lateef & Sons contractors in 2013. The arrest of the PML-N president and NA Opp leader at a time when by-polls are round the corner has raised many an eyebrow. The erstwhile ruling party has called out the anti-graft body for its anti-PML-N bias repeatedly in the past, especially after the bureau initiated a probe against former prime minister Nawaz Sharif and his family, in the wake of the Panama Leaks. Many had linked the arrest of the Sharifs and other PML-N leaders in separate cases, namely Raja Qamarul Islam and Hanif Abbasi from Rawalpindi, in July ahead of general elections as a ploy to deny a level-playing field to the party on July 25. Commenting on the development, PML-N spokesperson Marriyum Aurangzeb said that the “history of using NAB political opponents was being repeated” and termed the arrest “illegal” as it was without any permission from the NA speaker; hence, “against the law”. The arrest comes days before the by-elections in the country, which the party said was a “clear indication of how much the government was afraid of the PML-N”. “Opponents consider a free and fair election their political death,” she said. Marriyum chided the government for what she termed “arresting PML-N president Shehbaz Sharif without any evidence of wrongdoing”. The PML-N spokesperson maintained that the ex-CM’s arrest is nothing but a clear case of “political revenge and just shows the government’s frustration after failing to woo people of Punjab with their performance”. She said that detractors did everything in their capacity to damage PML-N but could neither deprive it of its popularity nor succeeded in making a forward bloc in the party. The PML-N leader, however, urged the party workers, who had gathered outside the NAB office, to remain calm as the party’s leadership and legal team are already working for Shehbaz’s release. However, contradicting Marriyum’s claim, NAB Lahore said that they had informed the National Assembly speaker before detaining Shehbaz. In a letter issued on Friday, Additional Director (Staff) Muhammad Mazhar Javed stated that NAB Lahore Director General Shehzad Saleem had a telephonic conversation with NA Speaker Asad Qaiser and informed him about the bureau’s decision to arrest the opposition leader. 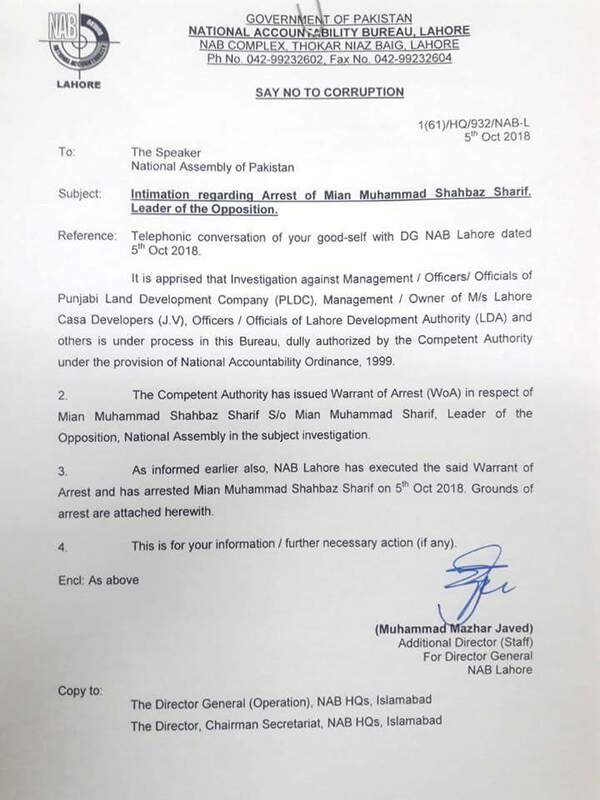 The letter further states that NAB issued arrest warrant for Shehbaz and also executed the action on the same day. Moreover, it was written that investigation was under process by the anti-graft body against the management and officials of PLDC, LDA and Lahore Casa Developers. The mentioned persons were being probed under the provision of National Accountability Ordinance, 1999, it added. Rejecting PML-N’s claims that Shehbaz’s arrest was carried out on the government’s directive, Information Minister Fawad Chaudhry said that ‘others’ involved in big cases will also be arrested as he vouched for NAB’s impartiality in the anti-corruption drive. The minister said that these cases were initiated by NAB during the tenure of the PML-N government, distancing his government from the arrest. He said that the PTI government is completely “neutral” in this matter, but it will support NAB as “an independent institution” to go after the corrupt. He informed reporters that according to the NAB Ordinance, there was an inquiry first, followed by an investigation and then a reference was filed. Besides Ashiana, Shehbaz Sharif has been accused of corruption in Punjab Power Development Companies (PPDC), Punjab Saafi Pani Companies (PSPC), and Multan Metro Bus Project. His arrest comes after blue-eyed civil servants Fawad Hasan Fawad and Ahad Cheema were taken into NAB’s custody in the Ashiana scam. Meanwhile, PSPC’s ex-CEO Waseem Ajmal and PSPC chairman Raja Qamarul Islam are being interrogated in Saaf Pani case. Sources in NAB said that Fawad and Waseem Ajmal had provided “incriminating evidence” against the former chief minister besides information retrieved from Fawad’s laptop which led to the arrest. Fawad had told NAB he awarded a contract to a “favourite firm” in the Ashiana Housing project at Shehbaz’s behest. Fawad admitted before the NAB investigators that being implementation secretary to then chief minister Shehbaz Sharif in 2013, he pressurised PLDC CEO to cancel the contract of M/S Latif & Sons and award it to M/S Lahore Casa Developers at the behest of his boss (Shehbaz). Besides Shehbaz, PML-N leaders Khawaja Saad Rafique and Khawaja Salman Rafique are also allegedly involved in the scam and have been summoned by NAB on October 16. Khawaja Saad and Salman Rafique’s arrest is also expected, sources claimed. In November 2017, NAB had launched a thorough probe into the affairs of the 56 public-sector companies formed by the Shehbaz administration in Punjab for their alleged involvement in corruption.